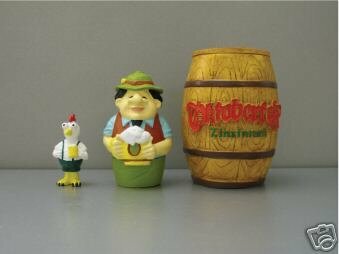 Set of 3 official Oktoberfest - Zinzinnati USA Nesting Dolls. The Beer Barrel measures 3.75" tall and is made of hard plastic. The German Beer Drinker measures 3.5" and is made of plaster. The Chicken Beer Drinker measures 2" and is made of plaster. Came with a bonus – a matching Zinzinnati Oktoberfest coin.